A motorcyclist was flown to a Pittsburgh hospital on Wednesday following an accident with a vehicle in Butler Township. 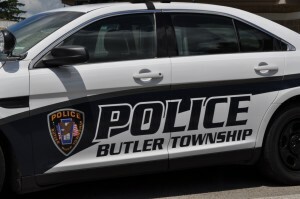 Gregory Macklin, 62, of Butler suffered a leg and shoulder injury when his bike and a vehicle collided near the parking area of Kohl’s in Butler Crossing. The crash happened just before 5 p.m. According to Butler Township Police, a man from California was attempting to make a left-turn from the parking area but stopped mid-turn because he saw the motorcycle approaching. Macklin told police he braked but lost control of his bike, and fell to the ground. The post Motorcyclist Hurt When Vehicle, Bike Collide In Butler Crossing appeared first on ButlerRadio.com – Butler, PA.